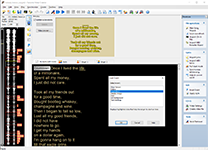 Karaoke Video Creator is an easy-to-use karaoke maker that will create songs in video (AVI and MP4/MPEG) file format. It allows to make karaoke videos from scratch or import CD+G karaoke songs and KAR (MIDI karaoke) files. You may use any MP3 or WAV file as a soundtrack and even use Power Vocal Remover to remove voice and lyrics from many non-karaoke songs. 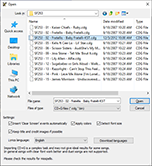 It is also possible to use soundtracks from video files. Our karaoke software is designed to be as easy-to-use as possible. Step-by-step tutorials will show you how to enter lyrics (or look them up on the Internet), how to synchronize them with music, and how to create karaoke videos in a matter of minutes. Advanced options allow to fine-tune video tracks (you may insert background images and videos, create title and credits screen, change font, display images and more). There is no limit for video resolution, so you may create high quality Full HD karaoke videos. Our Karaoke Video Creator duets feature allows to create a video that two singers can sing at the same time. If you would like to create a DVD disc with your own karaoke songs you may use our Karaoke DVD Burner. Karaoke Video Creator costs $119 USD. Discounts are available for current customers ($10 off). Create a karaoke video from scratch - our software makes it as easy as it gets. 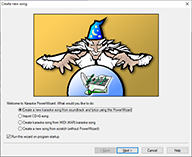 Create New Song PowerWizard will be your guide in this task. 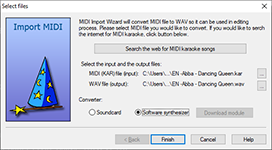 MIDI files are ideally suited for karaoke - they do not contain vocals and can be easily found on the Internet. And a lot of them contain synchronized lyrics. The most common file extension for MIDI Karaoke files is KAR, but many MIDI files also contain lyrics. Karaoke Video Creator allows to convert MIDI karaoke into karaoke videos. It also provides a tool to search for MIDI karaoke on the Internet. Karaoke Video Creator costs $119 USD. Discounts are available for current customers ($10 off) and when upgrading from Power Video Karaoke ($40 off).